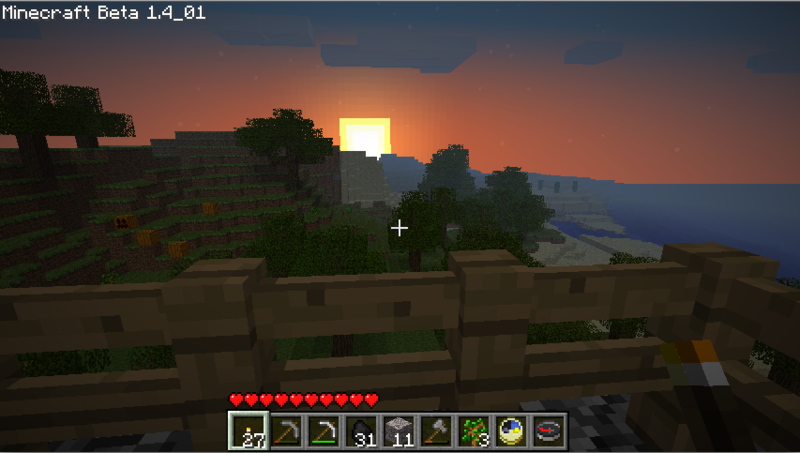 Hard to believe that I haven’t worked on my Minecraft world for almost a month; I guess I’ve been too busy in my weekends, and Rock Band 3 takes priority. 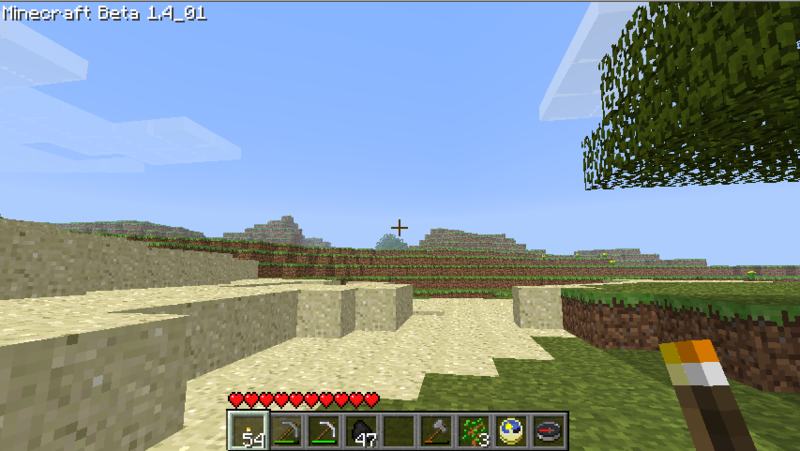 But I did find time today to play for an hour or two. There’s a tree farm immediately to the west of my front door; I knew there was a bit of sand beyond that, but I wasn’t sure what was past the sand. 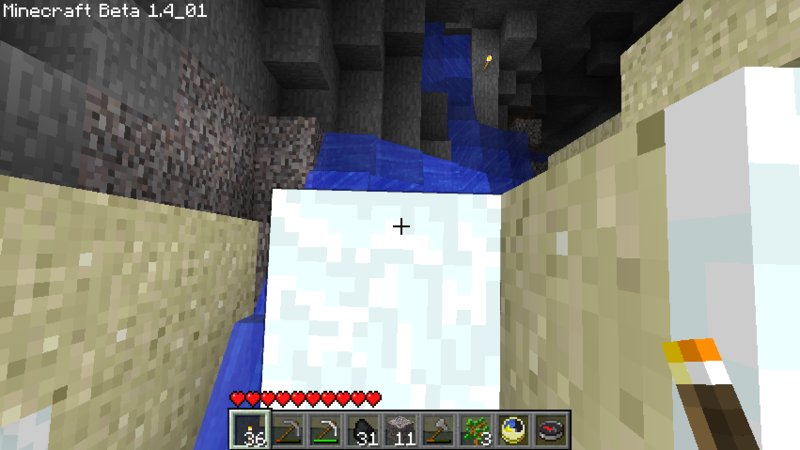 And water north of that area; it wouldn’t have surprised me if the water curved south and turned the western voyage into a very short trip indeed! That turned out not to be the case: the scenery to the west was, honestly, a little boring, and I ended up going north a bit to hug the coastline. 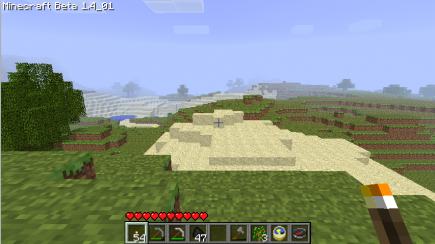 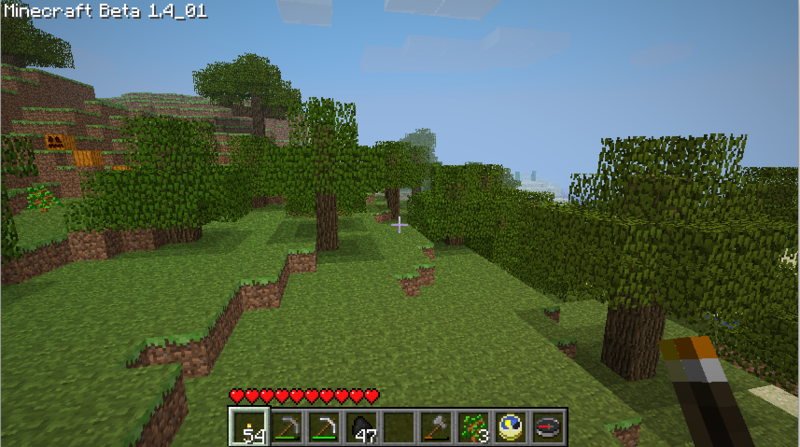 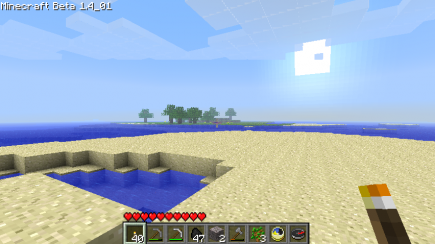 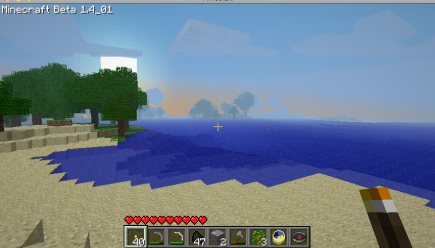 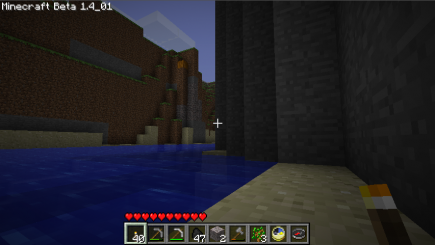 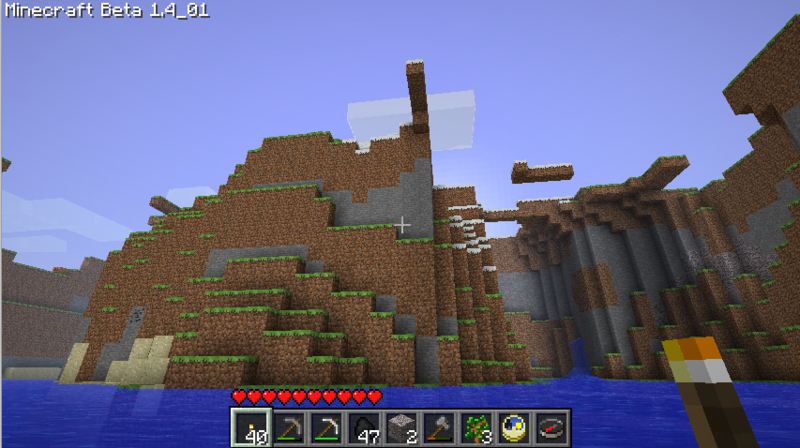 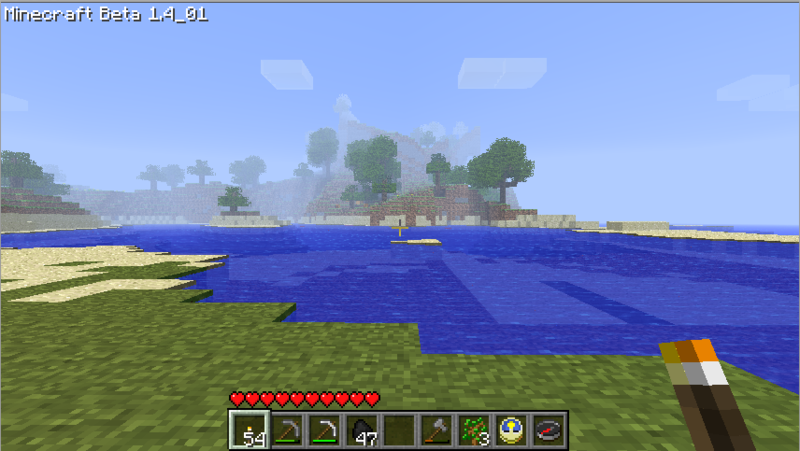 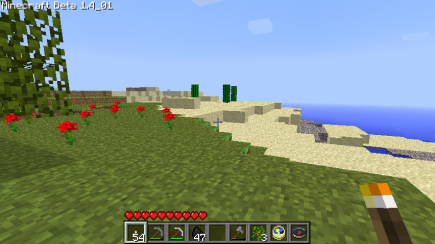 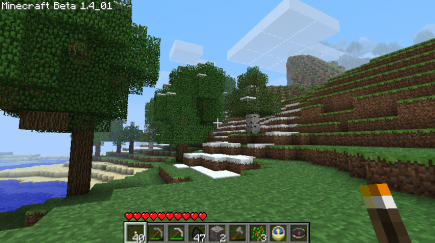 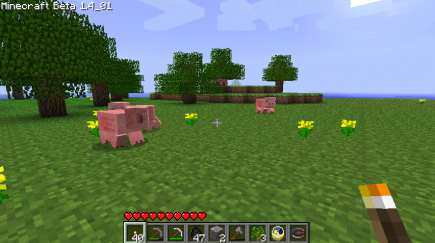 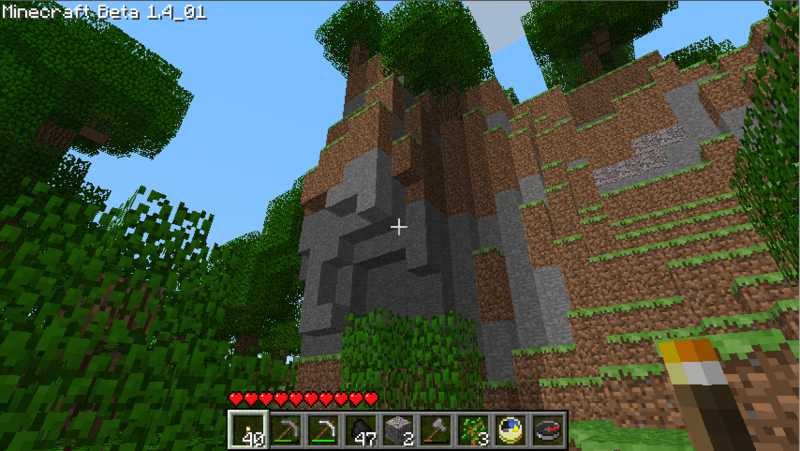 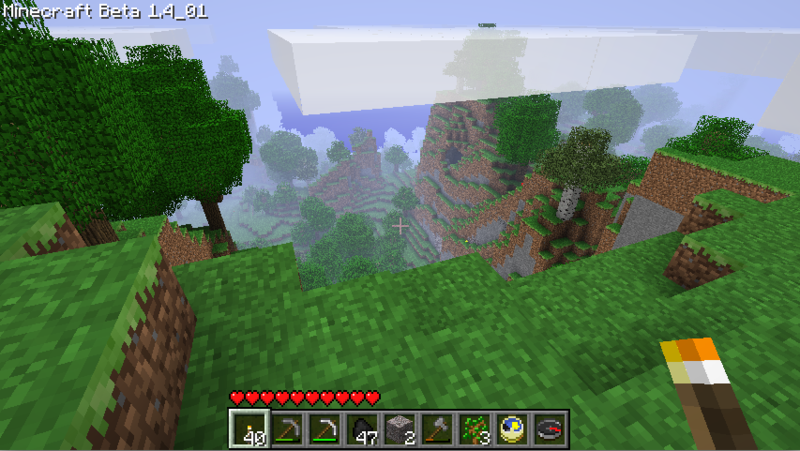 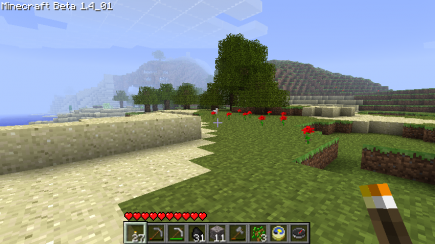 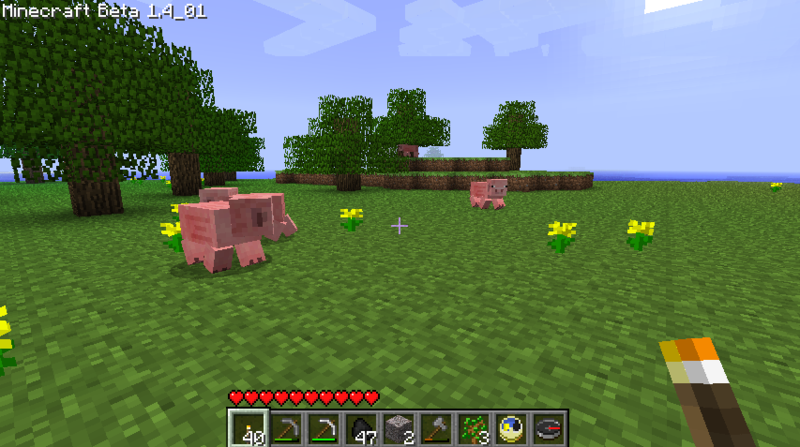 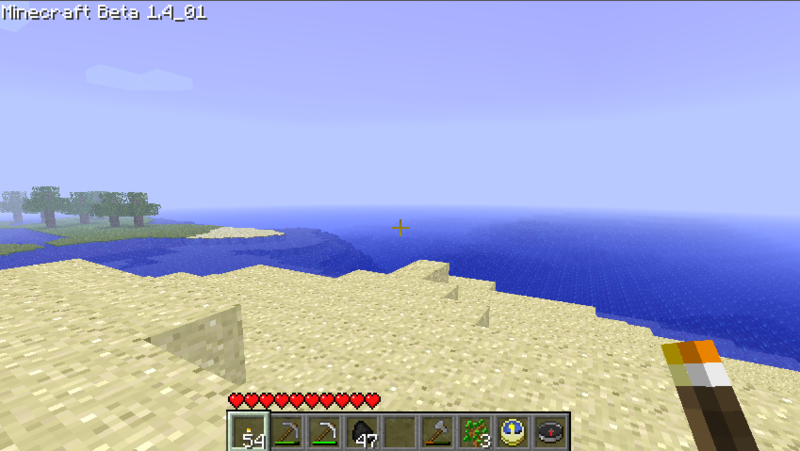 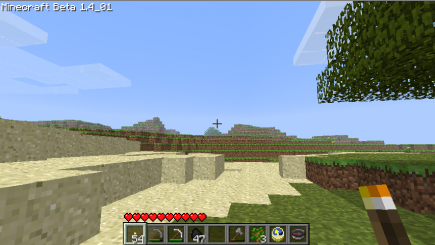 Eventually, the terrain got a bit more varied, and I saw some mountains. 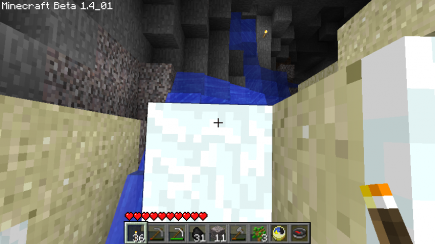 There was a cave inside the mountains, but it didn’t end up being particularly large. 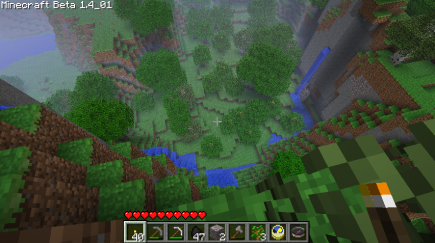 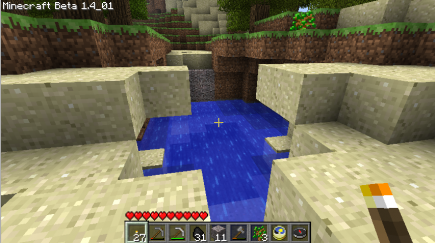 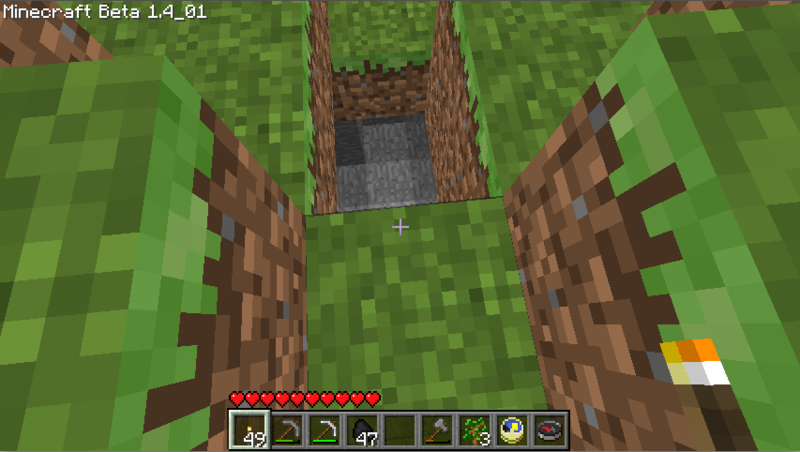 Continuing on from that, my next surprise was when I looked down at the grass below me and saw a hole! I dropped down, and it turned out to be another not particularly large cave, with a more normal exit on the other side. I kept on going until nightfall; not too much in the way of further excitement. 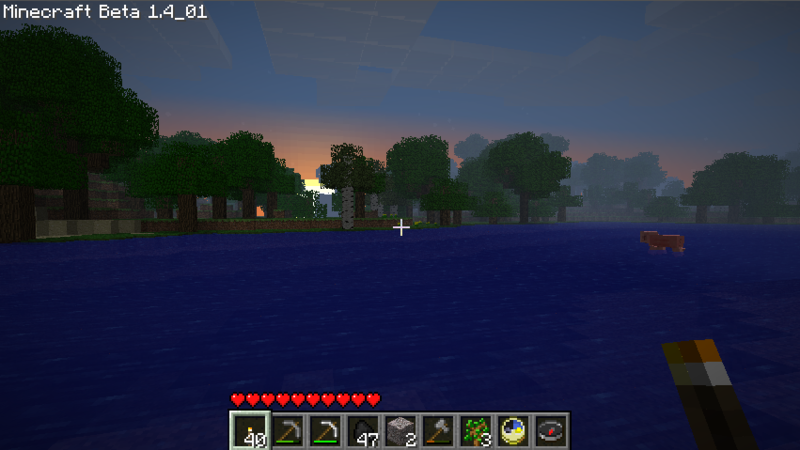 Eventually, the sun rose, and I trudged on. 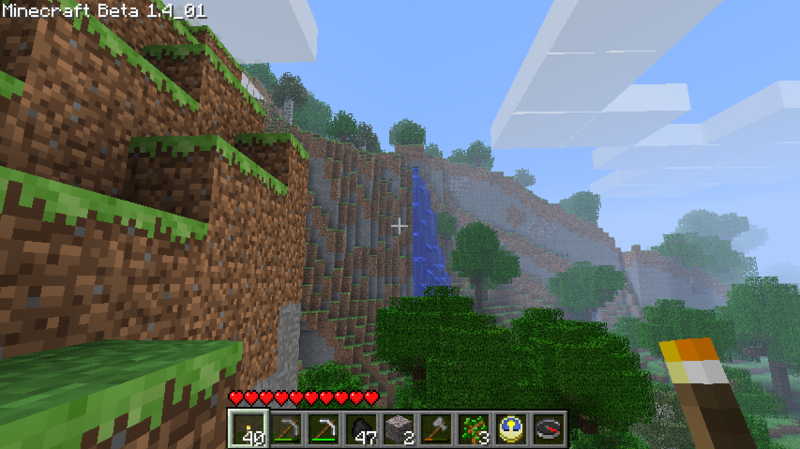 After a bit of hiking, I ran into a truly amazing cliff with a waterfall pouring down from it. 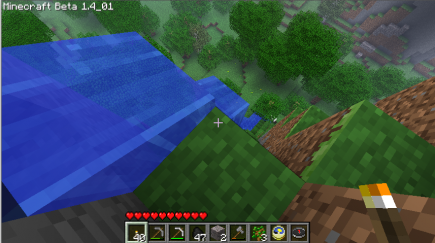 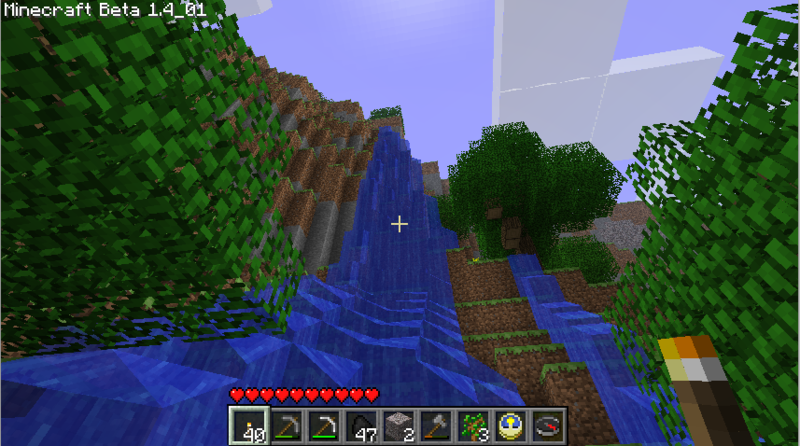 I swam up the waterfall; that cliff was really tall, bringing me up to cloud level! 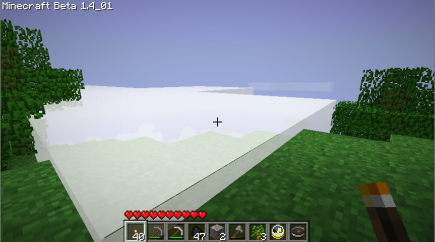 I’d never seen the clouds moving right past me before. 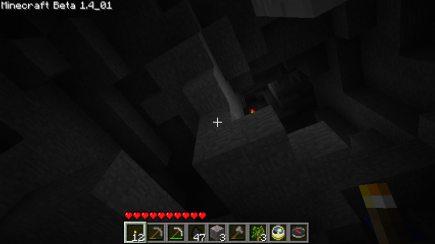 Somehow, I made it down without breaking my neck and kept going. 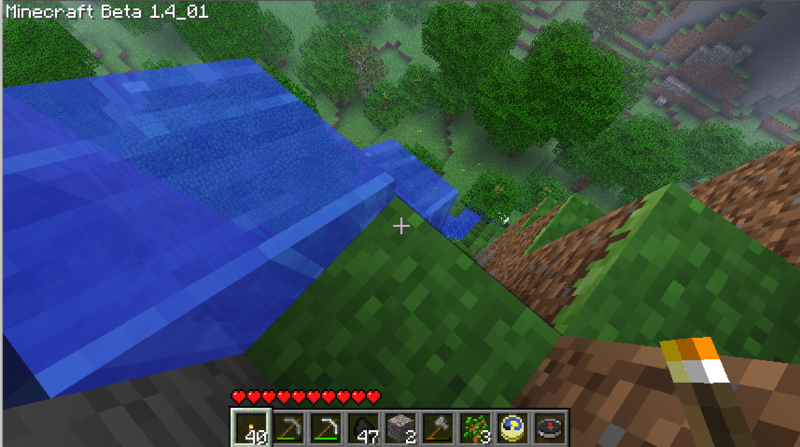 The next bit that caught my eye was a canyon with water in the middle; for some reason, I felt like I should be flying a ship in a Star Wars game through it. 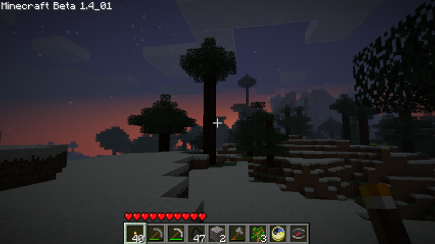 At this point, the sun was setting; I was in a winter region, with very tall trees. 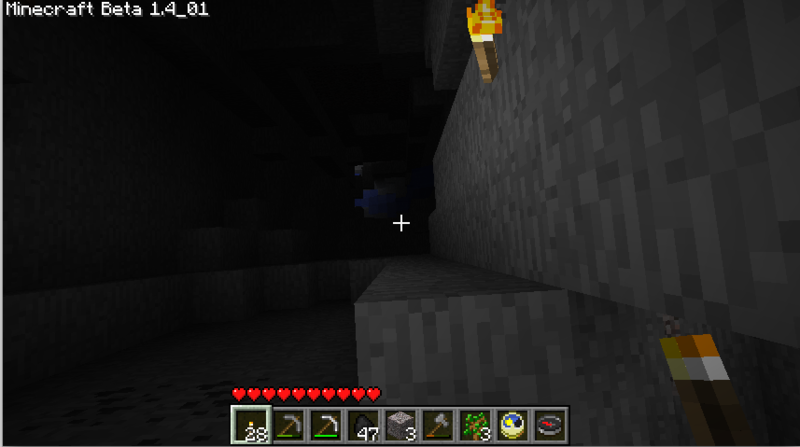 I was almost ready to go home, but one last cave caught my eye, so I decided to take a closer look. 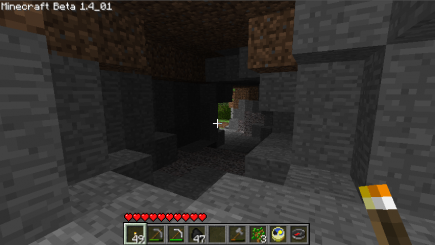 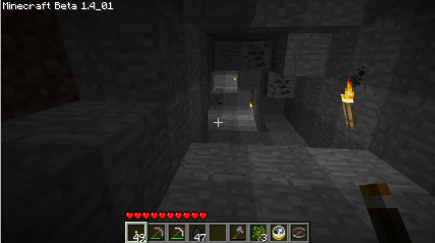 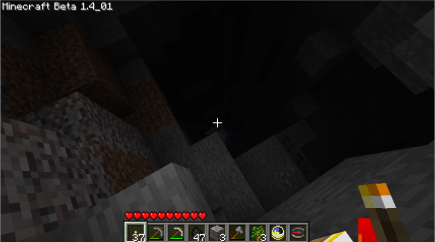 And, when I went down there, it seemed quite deep, and there was iron visible, so I had to hop down and explore/mine. 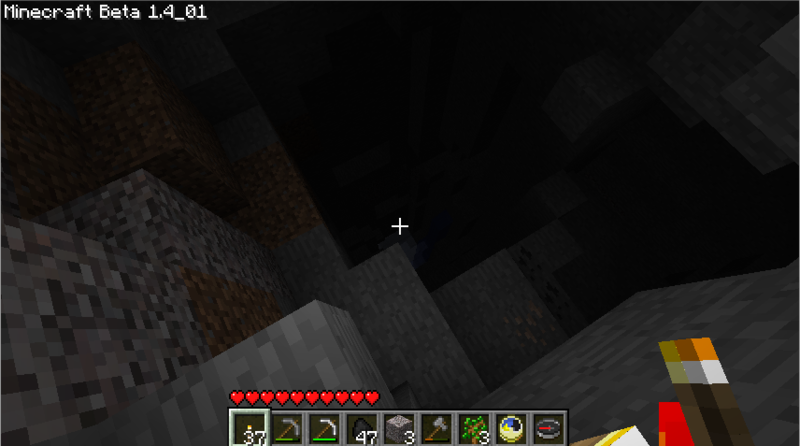 I think I see water below; but where's the light coming from? 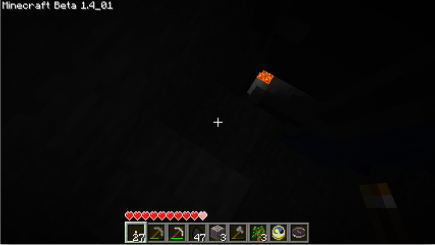 As always when you have unexpected light in a cave, there was lava. 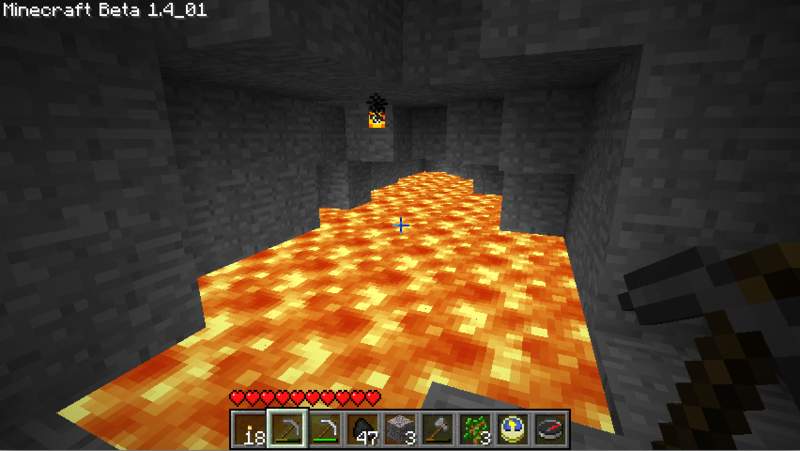 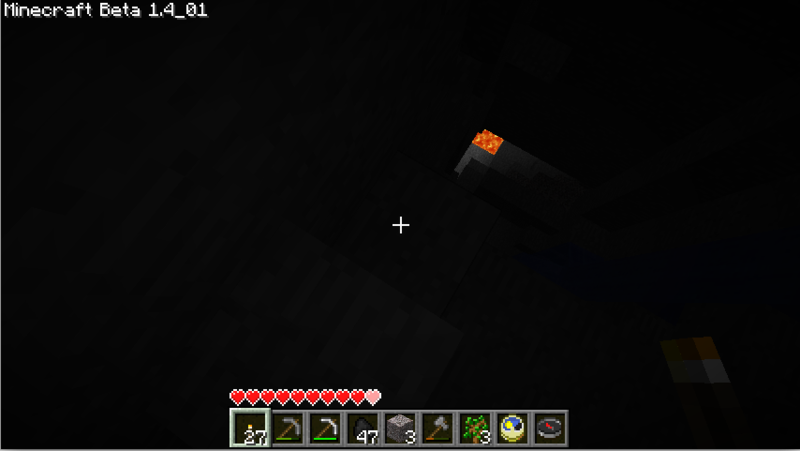 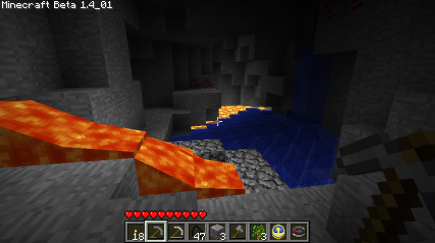 (Like I said, this cave was very deep: I went all the way down from the surface to the lava layer.) 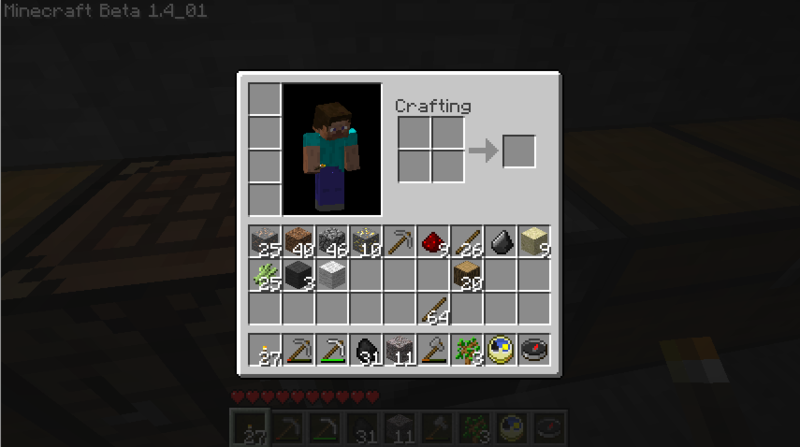 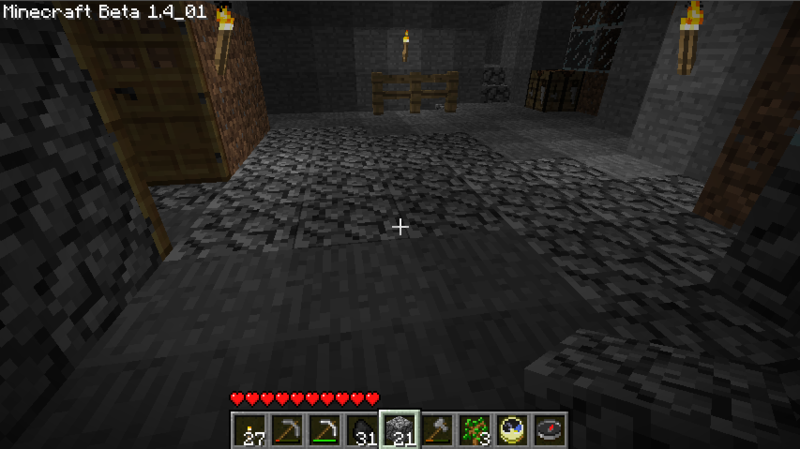 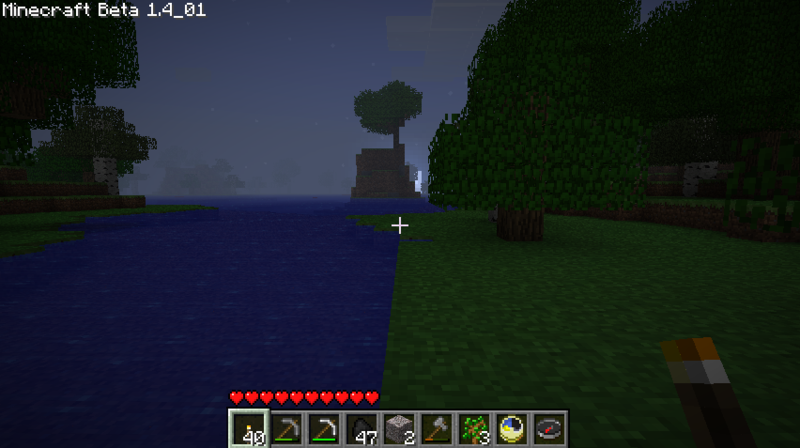 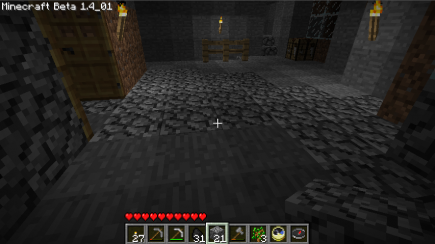 And there were good mining opportunities to be found: I ended up with 25 iron and some redstone and gold as well. At which point I was at the bottom of an enormous cave, with no clear idea of how to get up. 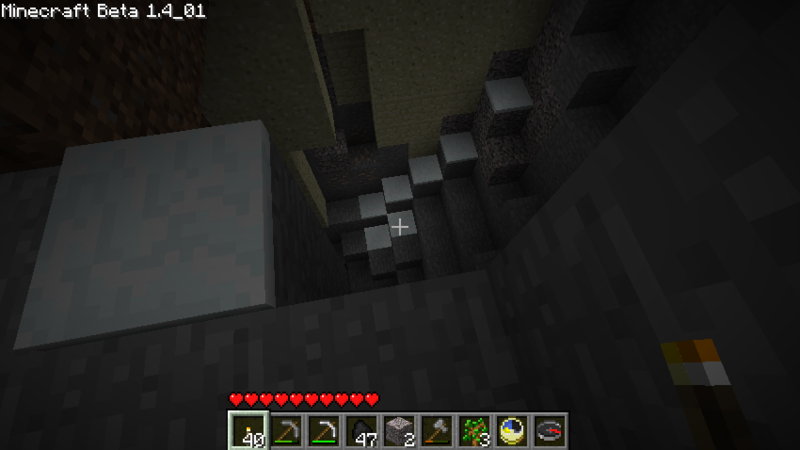 (The vast majority of my descent had had a generous assist from gravity.) 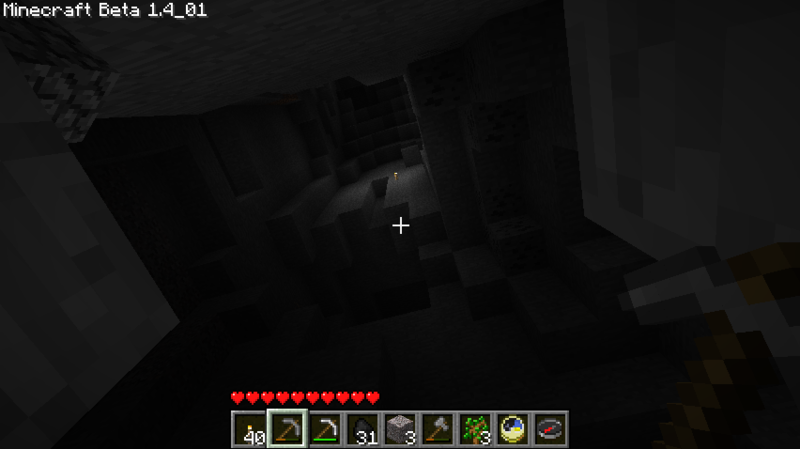 I didn’t even have a mental picture of which way I wanted to go; fortunately, at various points I could look up and see torches that I’d placed. 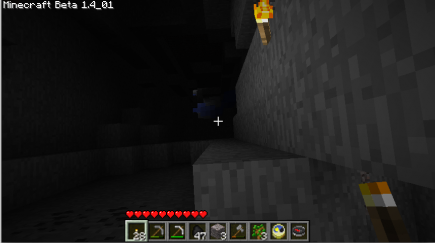 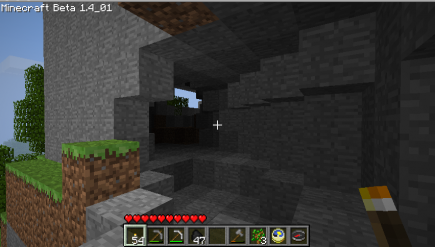 So I took out my pickaxe and started climbing, finding a few more caves along the way. 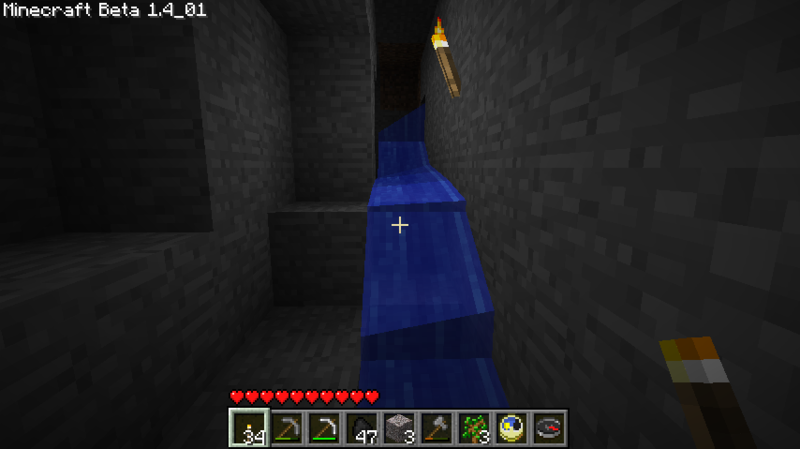 I guess I'm supposed to head up there somehow? 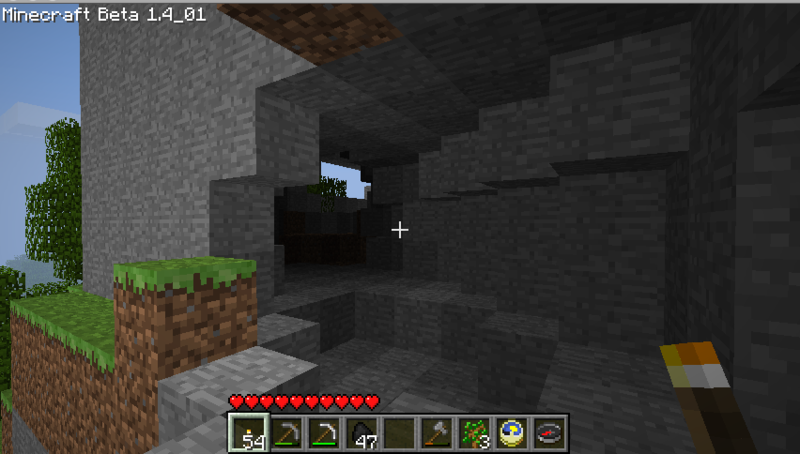 A truly glorious cave; a pity that it’s so far away from home, and that I have very little idea how to get back there! At any rate, I turned around and started trudging home after that. Which didn’t take so long, I made it home the same day, because I knew which direction to go and didn’t stop to take pictures and explore caves. 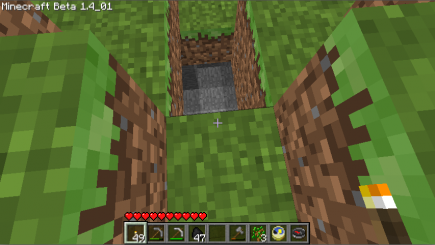 As I got close (quite close, you can see a sapling from my tree farm), I noticed a cute little pool under the sand; funny how such pleasant surprises can be lurking under your feet!